When the team at Cakes Today asked me to whip up some copy as part of their website transformation, I was delighted to go back to my cake roots! It was my job to put together the most craveable copy to showcase their different cake categories as well as build the brand identity and tone of voice through the 'About us'. I wrote about 7 pages for the total project, so I'm only giving you a slice of my favourite content. Cakes Today is a traditional, family-run bakery, ready to serve you the freshest and most delicious cakes for all occasions! Beginning our baking journey in 2011 in Wembley, we now pride ourselves on being the go-to for same-day cake deliveries. While we’re still young, our family have been passionately baking behind the scenes for generations. We learnt from the best - our great grandfather taught us all we needed to know about quality, craftsmanship and most importantly, bringing smiles to the faces of all our customers. With a skilled selection of bakers and decorators on hand, you can be sure that your order is made with only you in mind. Working as a close team, we use perfected recipes, mixed with new tips and tricks, to deliver slices of high quality, hand-baked indulgence. Get personal with cakes for all occasions! Whether it’s an upcoming birthday, wedding, anniversary, or you just fancy giving the gift of cake, we’ve got you covered. Pick your cake shape and size, icing and ribbon colour and top off any design with your very own message, which we’ll lovingly hand pipe. If you’ve got something extra special in mind, drop us a line and we’ll make your ideas come to life… and taste great too! Whether you’re looking for your party’s’ eye-catching centrepiece, a Friday afternoon office treat, or a slice of something delicious our range of cakes have something available for everyone! Baked and hand decorated in our Wembley bakery, we pride ourselves on delivering fluffy, velvety and must- have cakes every time. Click through to our selection of classic, premium and deluxe cakes, each crafted with their own blend of ingredients and decorated to perfection. What’s more, most of our cakes are customisable, so you can change the shape, size and ensure that your personalised message is piped on the top. We’ll even be sure to wrap your cake in your choice of ribbon, so it really does feel as special as it tastes! If you’re looking for something extra special, then we are always here to bake and decorate your dream cake. Want to tell us about your masterpiece? Then give us a call on 0207 1110 110 and we’ll make your idea come to life! We’re open 7 days a week, between 8am – 10pm, so we’re here to cater for your last minute plans! Explore our range of hand baked Premium cakes to add an extra special touch to your celebrations! Whether you’re looking for a chocolate-packed birthday cake, a treat for fruit fanatic friends or a last minute gift at the office, we’ve got you covered! What’s more, most of our cakes are customisable, right down to the shape, icing colour and any special message you want to add! We wrap most of our cakes in your choice of ribbon and top them with our Cakes Today seal from one of our specialist bakers, so you know you’ll only receive quality. We pride ourselves on catering for those with vegan, dairy-free and gluten-free needs, so drop us a line to see if your favourite can be made just the way you want. London locals are in for an extra treat, as we offer same day cake deliveries. This way your cakes arrive with you light, creamy and ready to be the highlight of your party! If you thought cheesecakes were just for dessert, then you’re in for a treat! Choose from a variety of indulgent flavours, from sweet strawberries, smooth white chocolate, tangy passionfruit or the extra crunch of cookies and cream. Over the years, we’ve perfected the mix between cream cheese, biscuit bases and lavish decorations. Let your fork glide through the rich and fluffy soft cheese, through to the topping, all the way down to the crumbly base, where you know every mouthful is a treat for the tastebuds. Our cheesecakes are made to be the centrepiece of any party. They are easily personalised with your own message, which is intricately piped on by a team of decorators, who take pride in perfecting your cheesecake, every time. 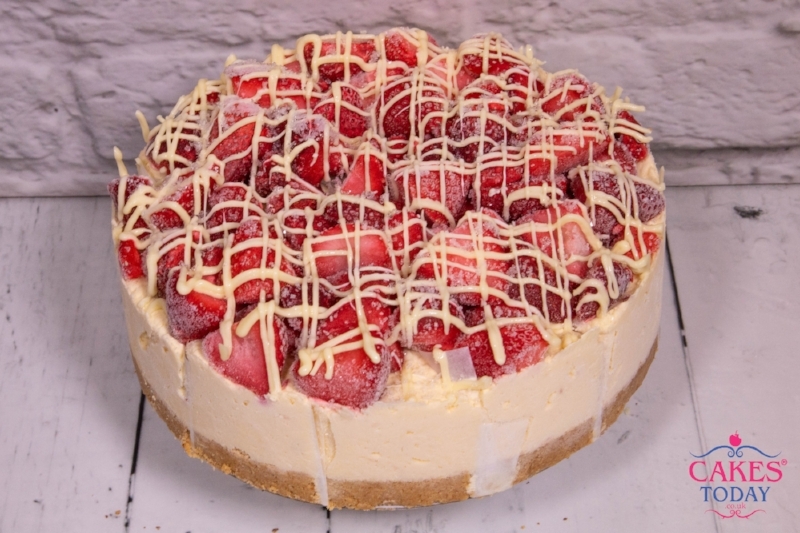 For a same day treat, we can hand deliver your choice of cheesecake to your door. We’ll start making your base in our Wembley bakery as soon as you order and decorate it as soon as it cools. Once we’ve crafted your cheesecake creation, our designated drivers will get your cheesecake in your hands, ready for you to slice and share with all your guests! As tasty as they are cute, our cupcakes come in an array of flavours that are perfect for any palate! Crafted in our Wembley bakery, we hand make all of our cupcakes, so you can create your favourite flavour box. Simply choose from a range of design options – from fresh fruit creations, intricately decorated toppers, or your own edible image on top – and we’ll take care of the rest. Perfect for any occasion, pick up a box of our cupcakes as the ideal addition for those upcoming birthday parties, a surprise gift for a loved one or to celebrate that Friday feeling in the office. With only a minimum of six per flavour required, the possibilities of flavour combinations are endless! Think classic vanilla and red velvet, to daring cinnamon and mandarin, all the way through to our renowned and super indulgent chocolate. We take care in baking your cupcake creation, ensuring that every single cake is decorated to perfection. Our care doesn’t end in the bakery, as we pride ourselves in our personal, hand delivery – the only way you know you’ll receive your cupcakes safe and sound…and ready to eat! With over seven years of baking behind us, we know exactly how to make your wedding cake dreams come true! We pride ourselves on having one of the largest baking and decorating teams in London, ready and waiting to craft a cake that fits seamlessly into your big day! Whether you’re opting for a traditional wedding, or something more modern and lavish, we’re on hand to create the cake that everyone is talking about! We’re ready to have our cake and eat it, by not only telling you, but showing you what we can do! Drop us a line to book your free wedding cake consultation, where we show you exactly what we can deliver. Come taste slices of our hand baked custom cakes, creams, jams and anything else you think will put the cherry on top of your big day! We’ll take this time to really listen to you, making note of colours, themes and any wishes you have. Together we’ll work our magic to come up with your wedding centrepiece. Make sure that you’re not worrying about your cake on your big day with our special hand delivered service, which also includes setting up the cake at your venue. This way, it’s all ready and waiting for you to slice and your guests to eat! To start your creating your dream wedding cake, drop us a line today at 0207 110 110 and ping us an email at info@cakestoday.co.uk where we’ll be ready and waiting to chat about your big day! We don’t just bake cakes, we’re your one stop shop for savoury snacks too! Treat the office team or impress visiting clients with a selection of handmade sandwiches, wraps or snacks from around the globe. If you do fancy a treat, we also offer a delicious range of croissants, cream cupcakes and doughnuts, a perfect selection for sharing! Plus, we also bake and hand decorate cakes with your very own edible image, adding a special touch to office celebrations. All you need to do is send us the snap you want printed on your cake or cupcakes and we’ll sort the rest. Our platters are all vegetarian but we pride ourselves on catering for those with vegan and dairy-free needs, as well as egg-free and even onion and garlic free. As we bake everything fresh on site, we can make your favourite just the way you want it. These are then sealed in premium containers, with elegant garnishing, so all you have to do is open and enjoy. For a stress-free end to your week, get your platter or custom corporate cake through our simple ordering service. What’s more, we offer London locals same day delivery, so your platters arrive fresh and secure, just in the nick of time.